Looking for creative ways to celebrate Saint Patrick’s Day this year? Why not stage a revival of Saint Patrick for Ireland? While in Dublin, Shirley decided to appeal to his local audiences with a play about Ireland’s patron saint, Patrick. As a teenager in the early fifth century, Patrick was kidnapped from his home in Britain by Irish pirates; he was held as a slave for six years, working as a shepherd, during which time he converted to Christianity. Eventually, he was able to escape home to Britain, where he rose to prominence as a student of and advocate for Christianity. 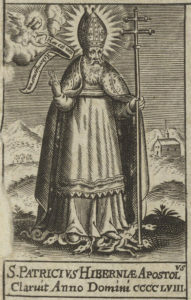 An image of Saint Patrick, in his bishop’s regalia, from the title page for a 1636 book of saints’ lives. 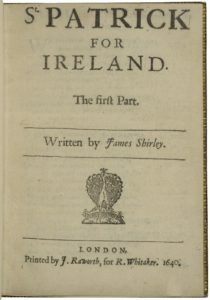 Saint Patrick for Ireland, published in 1640, picks up Patrick’s story as he prepares to return to Ireland as a missionary. It is presented as a “neo-miracle” play, a descendant of the miracle plays (performances of Bible stories, usually) that were common in the medieval era. In the play the Irish king, supported by the Druids, fears Saint Patrick’s arrival as a military invasion and tries to poison him; a servant is accidentally poisoned instead, but is brought back to life by Patrick, thus proving his divine backing. The head druid summons poisonous snakes to kill Saint Patrick as he sleeps, but he awakens and casts them from the island. Eventually, having been persuaded by Patrick’s feats, the king converts to Christianity, and the play ends on that triumphant note. We have two copies of Saint Patrick for Ireland in our collection at the Folger. They are both fairly straightforward copies, with few to no markings on the pages. One is in a plain cloth binding, while the other is a leather binding by Riviere and Sons, a major bookbinding firm in the mid-nineteenth century. Both have had to substitute pages from other copies of the play to make up for missing pages – not an uncommon practice by booksellers in the eighteenth and nineteenth centuries. If you do decide to stage Saint Patrick for Ireland, let us know how your production turns out! To learn more about the first printing of the play and its early performances, check out its entry in the Folger’s Digital Anthology of Early Modern Drama.